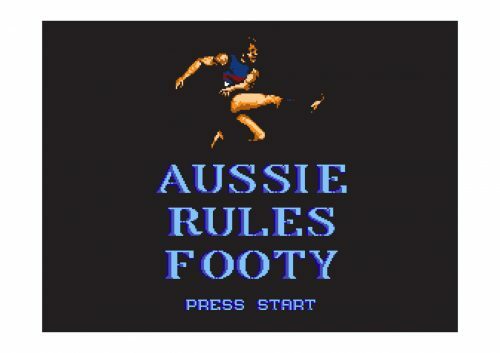 When West Coast and Hawthorn were battling it out on the field in 1991, Nintendo and Sega were battling it out in lounge rooms across the world. Melbourne-based Beam Studios saw an opening in the market and released Aussie Rules Football for the Nintendo Entertainment System. Here is it in action. The game wasn’t officially licensed by the AFL, but the developers could use the suburb and city names attached to familiar clubs, as well as a few new ones like Hobart and Darwin. But of course, guernseys and club colours were off-limits. So 25 years on I’m making amends. Here are your 2016 Grand Finalists in all their 8-bit glory. Occasional contributor, illustrator of Footy Places and other things (see my web store below). The computer must’ve been smashing the ‘A’ button at the ruck contest, Mark.